The 50 kg Brimstone strike missile will be fitted to the Royal Air Force's Protector RG Mk1, which will replace the Reaper MALE Remotely Piloted Air Systems (RPAS). MBDA says the Brimstone will provide key new capabilities to the RAF's ISTAR force, enabling them to engage high-speed moving and manoeuvring targets (including maritime fast attack craft for the first time). The Protector RG Mk1 can carry three lightweight Brimstones per weapon station, and offers a much higher 'loadout' than the Reaper platform it replaces. The Reaper MALE RPAS continues to be used in operations in the Middle East. However, RAF Wing Commander Iain Hutchinson, head of the Protector test team, says the Protector will expand upon Reaper’s long-range surveillance and precision strike capabilities. The UK will acquire an initial 16 Protector aircraft fromGeneral Atomics Aeronautical Systems. Protector will also be used in a wider variety of missions than the Predator, including humanitarian relief, as it will be certified to fly in both national and international airspace. 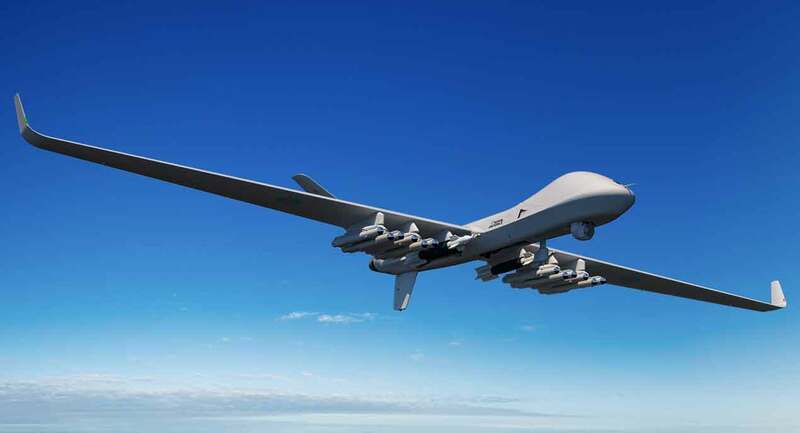 The integration of the Brimstone onto the Protector RG Mk1 (which is the weaponised version of the MQ-9B SkyGuardian) follows a series of successful firing trials of Brimstone from the Reaper/Predator B aircraft in the United States. The integration will be completed in time for the entry to service of the aircraft with the RAF. Brimstone is a lightweight (50 kg) strike missile with an advanced dual-mode mmW/SAL seeker, capable of engaging a wide range of target types, including fast-moving vehicles / vessels in both land and naval environments and in both direct and indirect modes. “Protector RG Mk1 is the third UK air platform to benefit from the unmatched capabilities of the Brimstone missile, providing UK Armed Forces with vital operational advantages and sovereign defence capabilities,” said James Allibone, MBDA’s UK sales director. Allibone says Brimstone is unique in its ability to be carried by platforms in all domains, land, sea and air, providing a common weapon that delivers both operational and cost benefits. Earlier in 2018, the UK MoD announced a £400 million contract with MBDA for the capability sustainment programme (CSP) of Brimstone missile, to build new missiles and extend its service life beyond 2030.